Workshop at Garaget, Malmö. Linnea Arbab Svensson, CC:BY-NC. The initiative Women Making History (also known as Women 100 or One-Hundred Years of Immigrant Women’s Life and Work in Malmö) initiated by Parvin Ardalan and the network Feminist Dialog, aims to make visible the histories of immigrant women and involving citizens in new engagements with popular memory and to ‘make history’ anew. Through seminars, workshops, newsletters, a digital platform, a physical exhibition at Malmö Museum, and as a collaborative book project, the experiences of immigrant women over the last 100 years are brought up in new interpretations, writings and debate. Immigrant women have played a crucial part in the build-up of the Swedish welfare state through their contribution in factories, companies (in particular during decades where native Swedish born women were working at home). Today, a third of the population in Malmö as foreign born and half of these ware women. The city has received new residents steadily since the 1930s at a time were Sweden changed from country of emigration to become a country of immigration. However, despite being a city of immigration, and with a historical slight overweight of incoming women, the experiences of these women are not included in the official history of the city. Researchers Erling Björgvinsson and Anders Høg Hansen from the Living Archives project explore how to collect and represent these stories and histories, and are involved in the everyday running of the initiative. Researchers: Erling Björgvinsson and Anders Høg Hansen. Partners: Feminist Dialog, Malmö University, Malmö Museum, Culture Department at the City of Malmö, and ABF. All posts on this blog about this “archive in process” is found under the tag 100 Years of immigrant women. The movement Women 100 is both historical and contemporary. It aims to engage with a process from when immigration to Malmö slowly began in the 1920s (at a time where Northern Europe was deeply immersed in racial and racist ideologies) and up till today where a third of the population is born outside of Sweden and 170 nationalities reside in the city. The immigrant women’s crucial role in building the Swedish welfare state is largely absent from traditional history writing. In addition, the archives and collections contain little or often un-interpreted material and objects. The movement aims to complement or even rewrite history by igniting the subjects themselves to debate and contribute. Researchers Erling Björgvinsson and Anders Høg Hansen from the Living Archives project are interested in the ambiguous as well as agonistic nature of immigrant memory, but also to find archiving practices that could mirror this tricky condition where multiple accounts or mediations weave into each other. One of the key ideas of the Living Archives research project is to approach and work with digital (and physical) archives for cultural heritage as potential social resources, and to explore how they can facilitate social change, create cultural awareness, and collective collaboration. This broad approach fitted well with Parvin Ardalan’s visions of the movement where the idea was that women would define and shape the collecting and showing, which poses challenges to how museums traditionally collect, archive, and exhibit. 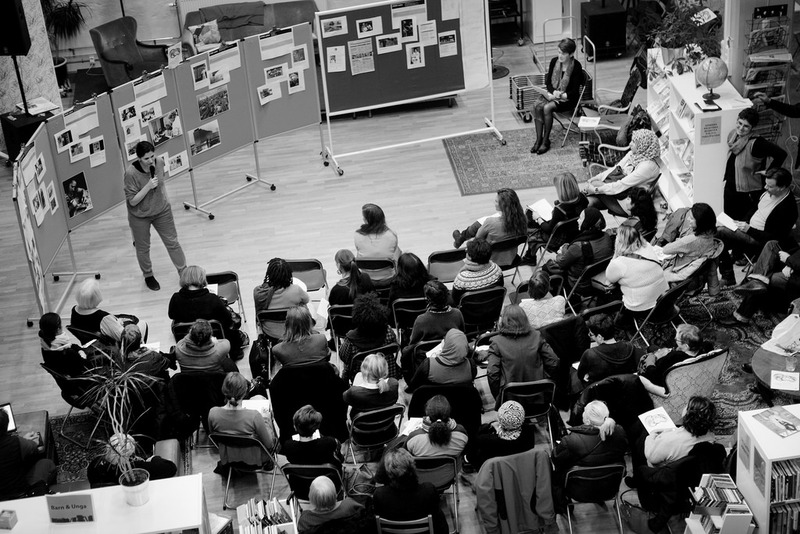 Two workshops, facilitated by immigrant women and Parvin Ardalan, took place in December 2013 and February 2014 with the aim of getting an overview of the stories immigrant women wanted to share, as well as producing content ideas and issues for the Malmö Museum exhibition. A range of workshops have taken place since the first one at Garaget in December 2013. They have been structured by various forms of input, for example, the very first workshop exhibiting a a timeline on women’s work and life (with gaps and room for input), and tales from guest speakers on immigration. The second workshop worked with the method of cue cards with themes triggering discussion in groups. Further workshops on storytelling immigration issues in cartoons, on Roma life in Malmö, on interviewing, and researching in archives and so forth, have taken place over the last years. Material has been represented at a Tumblr website and the Women Making History exhibition at Malmö Museum which complement various newsletters, physical mediations and activities with material travelling back and forth. For example, contributors can, both online and offline, produce and share postcards. The postcards are placed online, making them available for printing and sharing, not only at the Museum exhibition or at workshops and other events, but ideally in barber shops, at bars, and so forth, where people can pick a card, thus taking history into possession and then passing it on – or write one oneself, place it somewhere, or send it to the editors of the Tumblr website. Read newsletters from 2013, 2014, 2015 (1), and 2015 (2), which among other things summarize the outcomes of the workshops held in the project. In addition, a book came out in 2016 unveiling collaborative writing by activists, journalists and academics (some of these immigrant women) with the aim of re-writing the history of Malmö thorugh a series of timelines covering the last 100 years. The book also included interviews and essays, drawing from earlier newsletter material and new research. The book is available at Malmö City Archive for 100 SEK. It is in Swedish, with an English language edition underway. Images from Women 100 Years are found in this Flickr album, most of them free to use as long as the photographer is attributed and the particular Creative Commons license is included.